Pope Francis will visit the Auschwitz-Birkenau concentration camp in July, as part of World Youth Day. This trip coincides with his five day trip to Poland, arriving on July 27 and departing July 31. Pope John Paul II, himself Polish, became the first pope to visit the camp. Benedict XVI visited in 2006. The US Holocaust Museum estimates that the SS had murdered at least 960,000 of the 1.1m Jews deported to the camp. Of the 23,000 Romani, the Nazis murdered 21,000. Other victims included 15,000 Poles, 15,000 Soviet prisoners of war. And 10-15,000 members of other nationalities perished (including Czechs, Yugoslavs, Germans, Austrians and French). On June 7, 1979, Pope John II made a five-hour visit to the camp. He prayed before a stone crucifix in memory of the Catholic priest Maksymilian Kolbe, prisoner number 16670, who the SS murdered in 1941. Kolbe volunteered to die, so Franciszek Gajowniczek, a father of five might live. Gajowniczek, the Polish army sargeant had been chosen to die in an Auschwitz dungeon called the “hunger bunker,” after a prisoner had escaped. Kolbe pleaded, ‘I want to take the place of this man. He has a wife and a family. I have no one. I am a Catholic priest.’ He and ten others were then marched away, stripped naked and starved. To console the others, Kolbe consoled the condemned men with prayers and hymns. Kolbe and three others had survived for ten days. Then a doctor arrived and killed them with injections of carbolic acid. In 1982, the Catholic church canonised Kolbe. Gajowniczek had survived the war and died in 1995 aged 95. John Paul also remembered the life of Edith Stein, a German-Jewish philosopher who converted to Catholicism. A Carmelite Sister Benedicta of the Cross, she died like many others in the gas chambers of the camp. The Catholic church beatified her in 1987, which confused and upset Jewish groups as Edith Stein died because she was Jewish, not a Catholic nun. 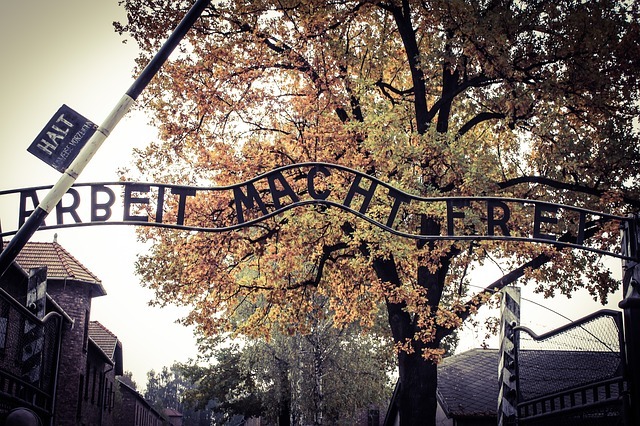 On Auschwitz, Pope John Paul II described it as, “A place built on hatred and on contempt for man in the name of a crazed ideology. A place built on cruelty.’ He came to ‘kneel on this Golgotha of the modern world, on these tombs, largely nameless like the great tomb of the Unknown Soldier”. The 1979 visit came fourteen years after the Second Vatican Council of 1965 declared that Jewish communities were not responsible for the death of Christ. A test of this Jewish-Catholic reconciliation took place in 1993. Carmelite nuns had lived in a convent converted from a building used by the Nazis to store Zkylon B gas. It had caused tensions between Jewish and Catholic communities since 1987. A deal between cardinals and leaders of Jewish organisations had agreed to move the convent away from the camp. In 1989, Avraham Weiss, a New York City rabbi, had broken into the convent in protest at their failure to abide by the agreement. Pope John Paul II wrote to the convent, asking the nuns to re-locate helped diffuse tensions. In a 2006 visit, Pope Benedict XVI echoed the words of his predocessor. In his address he said, “All these inscriptions speak of human grief, they give us a glimpse of the cynicism of that regime which treated men and women as material objects, and failed to see them as persons embodying the image of God”. The German-born pope made it a personal mission to visit the camp during his papacy, having first visited in 1979 as Archbishop of Munich-Freising. Benedict faced criticism for dealing with this historical trauma through a theological, not emotional lens. Perhaps this disassociation owed to his own role in World War II. He had served as an antiaircraft unit but deserted and found himself inside an American prisoner of war. The BBC’s Adam Easton remarked that Benedict offered no apology for the role of ordinary Germans, nor did he make a direct reference to antisemitism. Pope Francis will also attend a mass there to celebrate the 1050th anniversary of the introduction of Christianity to Poland.